A couple from Strichen have presented more than £1,000 to the Neurological Research Fund. Mike and Helen Morgan celebrated their 50th wedding anniversary on March 24 and asked for donations to the fund in lieu of presents. 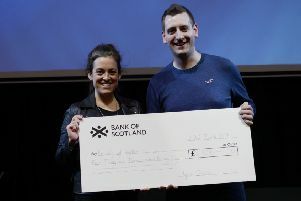 A total of £1,200 was raised and the couple are pictured above presenting the donation to Jacqui Forbes, Parkinsons Nurse Specialist for North Aberdeenshire. Jacqui added: “This donation will go towards research in Parkinsons and other neurological conditions in Aberdeen.